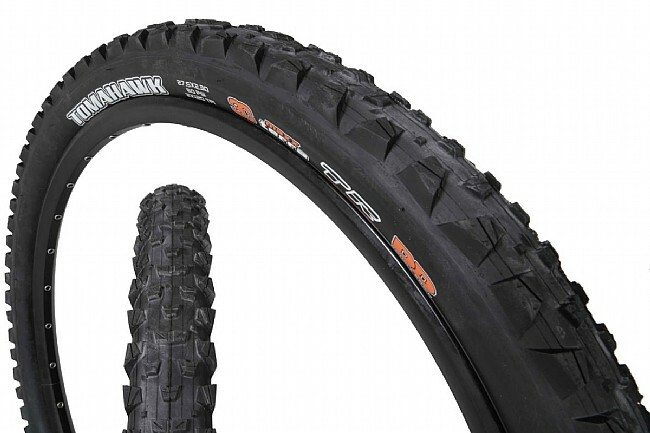 The Maxxis Tomahawk DD 27.5 Inch Tire is designed for fast and loose enduro racing. Rolling resistance has been minimized with shorter center and shoulder knobs but the edges remain sharp for leaning into corners. This means a faster tire than the typical knobby but more versatility than a semi-slick. 3C Maxx Terra rubber ensures the Tomahawk delivers maximum traction and longevity, and the Double Down dual-ply casing combines two 120 TPI nylon layers with a butyl insert for support and protection on rugged enduro terrain. 27.5” x 2.3”. 120 TPI dual-ply DD casing. Folding bead. Tubeless ready.